The authors of the international bestseller The Decision Book teach us how to communicate better at work and in everyday life The internationally bestselling duo Mikael Krogerus and Roman Tschappeler have tested the 44 most important communication theories - from Aristotle's thoughts on presenting through Proust on asking questions to the Harvard Negotiation Project - for their practicality in daily business life. In The Communication Book they distil them into a single volume that in their winning way turns seemingly difficult ideas into clear and entertaining diagrams. From running better meetings and improving the conversations in your head to brushing up on your listening skills and small talk, the pair masterfully fuses theoretical knowledge and business advice with humour and practicality. With sections on work, the self, relationships and language, they show that we can improve not only what we communicate, but how we do so. 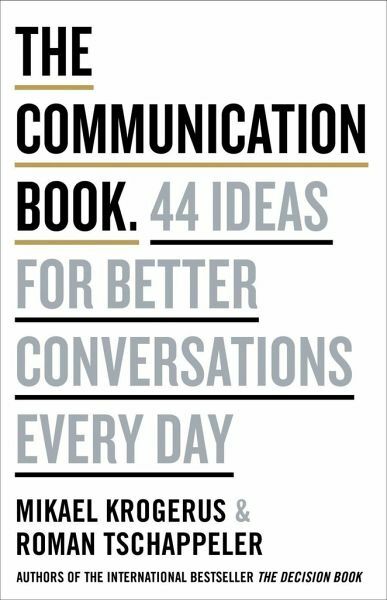 Whether you're a CEO or starting out - or want to improve your relationships at home - this smartly-illustrated and compact guide will improve your communication skills and help you form more meaningful connections at work, while smiling too. Mikael Krogerus (Author) Mikael Krogerus is a Finnish journalist who works as an editor on Switzerland's biggest weekly magazine, Das Magazin. Roman Tschäppeler (Author) Roman Tschäppeler is a creative producer based in Biel, Switzerland, who produces documentary movies, ad campaigns and art installations. Krogerus and Tschäppeler met at school in Denmark and have written four books together - The Question Book, The Test Book, The Change Book and the international bestseller, The Decision Book.